Mayon volcano, the pride of Bicolanos, with it's almost perfect cone shape is really magnificent when seen on clear, cloudless days with the crater visible. It's usually early mornings when you can see her "naked." 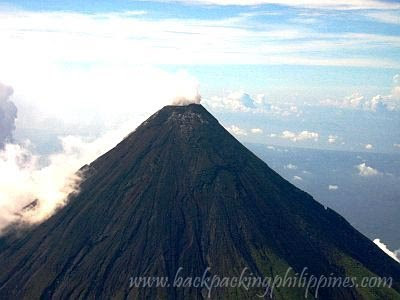 There's also an "advisory" to first time travelers to Legazpi City that first-timers to Bicol won't be able to catch sight of the Daragang Magayon that has spawned various legends and epics. Legend of Mayon Volcano tells about a beautiful young lady named Magayon who's beauty was so famous she was wooed by rich and powerful people. Magayon, with all her suitors, however, fell in love with a warrior named Handiong, who came from an enemy tribe of Magayon's. When their families learned of their love for each other, they tried to separate them and fought a bitter, bloody tribal war. To end the conflict, the lovers just decided to commit suicide together rather than separating but were buried separately by their respective tribes. 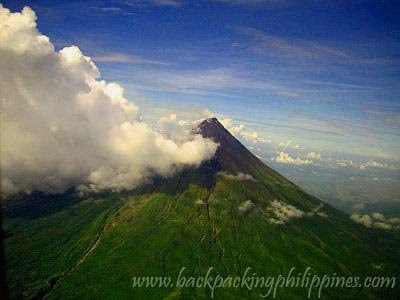 To highlight the beautiful volcano, the Magayon festival is celebrated all month of April in Legazpi City. Tutubi was there on the last day of March and he doesn't have information on Magayon Festival schedule of activities. Book an early morning flight to Legazpi City through PAL, Cebu Pacific or ZestAir and request to be seated on the left window side (the A column). Avoid the middle rows so as not to be obstructed by the airplane wing. You can do this by checking it early or booking online with Cebu Pacific using the seat selector feature for a small fee (Cebu Pacific Sure seats will be given away if you failed to check in 45 minutes before ETD). Tutubi always try to book seat 2A up to 8A so as to be one of the first to deplane also. 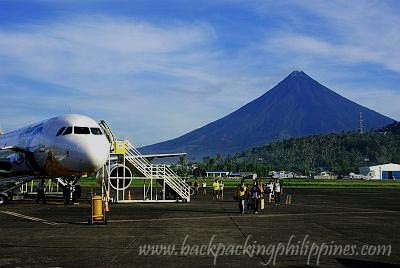 Flight time to Legaspi from Manila is just about 45 minutes so don't sleep or you'll miss it. Be ready with your binoculars or cameras, snap a picture in haste just before the fasten your seatbelt sign is switched on indicating you need to switch off all electronic devices, including your camera, in preparation for landing. Isn't Mayon volcano really Magayon? It's more beautiful than the snow-capped Mt. Fuji of Japan, the most photographed mountain on earth. Don't wish for Mayon to have snow though for the drastic change in weather would be disastrous in tropical Philippines. I love Mayon! I've been to it's summit two times. Nice photos! thank you very very much.. my project is completed..
wished for more best answers for my other searches.